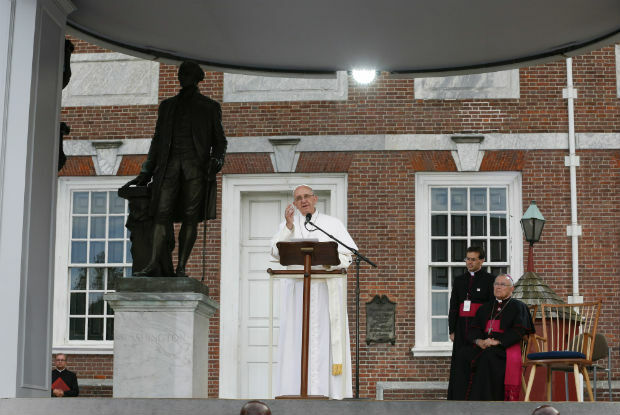 With Pope Francis’ first official visit to the United States, the “Francis Frenzy” continued Saturday afternoon, Sept. 26, at the “birthplace of freedom” — Independence Hall in Philadelphia. In his speech, Pope Francis emphasized the need for every voice to be heard, and for every human life to be respected. Dr. Lesly D’Ambola watched the pontiff’s speech from Franklin Square, where a Jumbotron was set up. She was particularly moved by Pope Francis wanting to speak on these topics, because immigration has touched much of her professional career. Pope Francis gave his speech in Spanish from the same lectern that Abraham Lincoln used to deliver the Gettysburg Address. Before the address, he blessed the Cross of the Encuentros, a five-foot-tall wooden cross that represents Hispanic and Latino Catholics in the U.S. and their faith journeys — an important gesture, considering that 40 percent of all Catholics in the U.S. are Latino. Given the recent refugee crisis involving Syria and Europe, and the ongoing demands for immigration reform in the U.S., it was only logical that Pope Francis would speak at length about the human side of these issues at length. College students seem to be drawn to papal visits, present and past. D’Ambola and her friend, Maura Markiewicz D’Arcy, were both students at St. Joseph’s University during the last papal visit to Philadelphia by St. John Paul II in 1979. D’Arcy recalls seeing the pope throwing a frisbee to a dog on the lawn of the cardinal’s residence from her dorm, and shares similar excitement about another pope coming to Philadelphia. D’Ambola was also particularly enthused about a Jesuit pope visiting Philadelphia, especially since Pope Francis focuses on issues prominent in this country and the world that deal with poverty and injustice. Pope Francis ended the address by leading the crowd in praying the “Our Father” in English, and asked that everyone remember to pray for him.